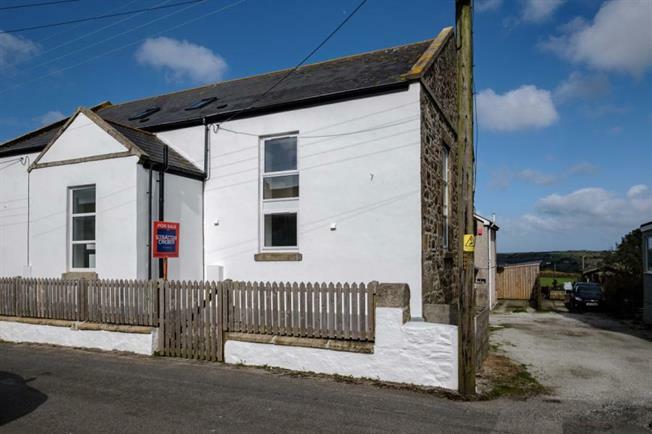 3 Bedroom Semi Detached House For Sale in Redruth for £188,000. A fantastic conversion completed to a very high standard with extremely spacious rooms. The property offers accommodation comprising an entrance hall, cloakroom, open plan living room and kitchen, three bedrooms to the first floor and a stunning bathroom with bath and shower. There are views to the rear across to St Agnes Beacon. There is parking for two cars. Large double glazed window. Double doors to the entrance hall. Stairs to the first floor with under stairs storage. Doors to cloakroom and lounge/kitchen. Wall panel heater. Fitted with a close coupled w.c. wash hand basin with cupboard below. Heated towel rail. Tiled flooring. Two double glazed high level windows. Three electric panel heaters. Fitted with wall and base units with matching drawers and work surfaces incorporating a stainless steel unit and drainer. Fitted oven and hob with hood above. Space for washing machine. Tiled flooring. Inset spot lights to the ceiling. Two high level double glazed windows. Wall panel electric heater. Large double glazed window to the rear with lovely views across to the St Agnes Beacon. Wall panel heater. A dual aspect room with double glazed window to the front and side. Electric wall panel heater. Large double glazed window to the side with countrywide views. Wall panel heater. Sky light. Panelled bath, close coupled w.c., wash hand basin with cupboard below. Heated towel rail. Spot lights to the ceiling. Enclosed courtyard area to the front. Parking to the side.